In our version of the dish we started with the bacon, or in our case, a braised pork belly that was slowly cooked over four hours. We then pan seared the belly in cast iron until the outside was crunchy but the center remained fork tender. Beneath the belly, and on the base of the plate we spooned a whip of 1/2 cauliflower with 1/2 potato with sour cream that had been processed in the VitaMix until it was super smooth. We shaved broccoli on the mandolin, tossed with garlic and olive oil and charred under the broiler until the flowers of the broccoli were black and crispy and the stalks were just cooked through. The broccoli was tossed in lemon juice and spooned as a nest over the whipped cauliflower. The cube of crispy pork belly placed on the nest of charred broccoli. What we needed now was some salty, cheesy component to spoon over the pork belly. We chose a grassy English cheddar. 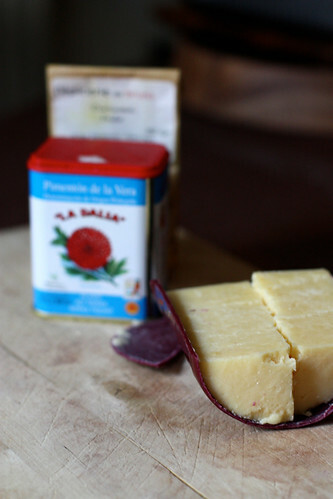 The flavor of the cheddar was both saltier and heavier than most French cheeses without adding any traces of bitterness. In order to get a cheese (other than Velveeta) to stabilize while hot, it was necessary to start with a béchamel. We grated in the cheddar, added some salt and white pepper and tasted. While the flavor was good, it was missing something. We also thought the dish was missing a color, white cheese sauce served over a white cauliflower whip looked rather drab. This dish needed some melty, neon, Wendy’s-esque sauce to spoon atop. 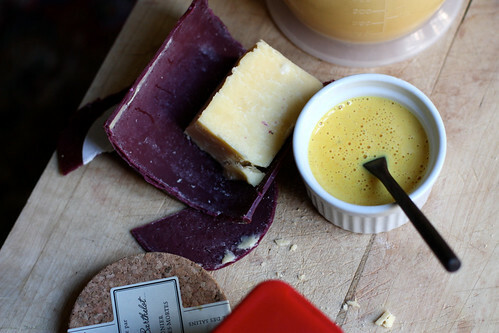 Using turmeric added a glowing yellow color to our cheese sauce. While the color was certainly Velveeta like, the turmeric added only a slight earthiness in the way of flavor. I added some of the incredible “La Dalia” smoked paprika from Epicerie de Bruno and the dish came alive. The smoked paprika added a heat, a tinge of red that turned the whole sauce more orange than yellow and gave the sauce a a scent that could be defined as nothing but “fast-food”. We spooned our new sauce on our crispy belly, watching as drips of neon orange streaked down the crispy bacon color of the pork belly. We topped the dish with a garnish of shaved chives and shaved scallions and tasted bite by bite. As you fork a piece of cheese drenched pork belly, it combines with cauliflower and little bits of burnt broccoli. Each bite hit successfully each element of the original. This cheese sauce great drizzled over broccoli, steamed or charred, over baked potatoes with or without the fixings, or simply in a skillet with a few sliced jalapenos and a bag of tortilla chips. 2. Once butter is completely melted, whisk in flour. Continue to whisk until flour is completely incorporated and a paste is formed. 3. 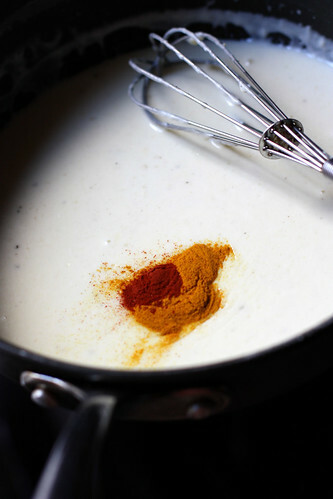 Add milk, turn heat up to high and whisk constantly until milk is bubbling and has thickened. 4. Reduce heat to low and add grated cheddar cheese, smoked paprika, turmeric and salt. Whisk to incorporate. 5. Reserve sauce over low heat. Add more milk if it starts to become too thick. This entry was posted on December 12, 2010 at 3:19 pm and is filed under Recipe, Snack. You can follow any responses to this entry through the RSS 2.0 feed. You can leave a response, or trackback from your own site.